Eagles Nest Vacation Lodge in beautiful Brown County Indiana is the ultimate vacation destination. A rare combination of natural beauty and upscale features found only in the most luxurious homes. 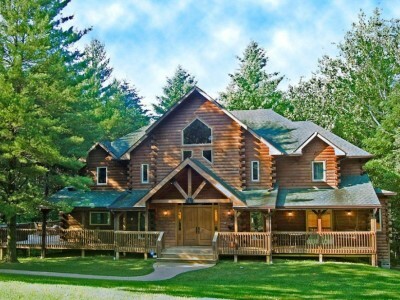 Eagles Nest features over 6000 square feet and three levels of premium living space, located on 7 enchanting, wooded acres and tucked away in the woods... a pond. This dream home has something for everyone. Five bedrooms, including 3 bedroom suites with morning kitchens, five and a half baths, eight Televisions with Satellite, one in each bedroom, one in the loft and two in the main basement, large jacuzzi tub in master bath, wrap around decks with two hot tubs, climate controls on every level, and touch screen music panels in 6 rooms. The lower level boasts a gorgeous hand carved bar, a Regulation Olhausen pool table, and many more amenities. Enjoy the evening nature sounds around the campfire. This incredible cabin is more than a place to vacation; it is truly an unforgettable vacation experience! Enter this magnificent vacation home through the custom crafted double mahogany doors into the oversized foyer equipped with a large wooden bench, a coat closet and shoe cubby. Just to the left you will see a very unique powder bath with whimsical features. After leaving the foyer, you will enter the charming and well-appointed great room. Walls full of windows and glass doors reveal a gorgeous wooded view and private pond beyond. The massive Brown County stone gas log fireplace with its hand carved mantle, will take your breath away! The stone stretches twenty three feet to the edge of the main ceiling. The dining room is located just off the great room and has seating for 10. The gourmet kitchen features double ovens, large cook top, prep and eating islands, or perhaps you would prefer the breakfast nook made for just two. The kitchen is fully equipped for preparing wonderful meals. The main floor hosts the master suite with its grizzly bear theme, and a luxurious king size bed, two down chairs for reading and a large entertainment center TV which can be enjoyed from the bed or viewing sofa. The master bathroom has his and her marble sinks, a large custom walk in shower, a handle held shower head and even a rain head. If soaking is more your style then the spacious jacuzzi tub for 2 tub will be your favorite area of the cabin. The sliding glass doors in the room lead to a hottub for 2 just outside the master suite. There is a washer and dryer available for your use in the master suite. The second floor has a large, open entertainment loft which includes lots of movies, satellite and a play station 2. Bring your favorite movie or game. This level also has two bedrooms. A wild stallion, cowboy theme bedroom, with a king size bed, one chair and one recliner for curling up with a good book. The on-suite bathroom will make you feel like the true cowboy as you walk up to the unique rustic sink with its copper basin. There is also a large tile walk in shower and a large closet. The final area on the second floor is the wolf themed suite. The king size bed is draped in a white lace canopy, there is a comfy reclining couch. The on-suite bathroom will take you back in time with a claw foot tub and pedestal sinks. There is also a shower, hidden just behind the door. Both of these suites feature morning kitchens for those late night snacks or early coffee. The lower level is the place for fun at the Eagle's Nest, boasting two LCD screen TV's, a beautiful bar, and the Regulation Olhausen pool table! There are couches to relax on a fireplace to keep you warm, a tables for gaming and a custom made bar for the true man cave. The lower level also hosts two bedrooms and bathrooms. First is a deer themed bedroom with a queen size bed and adjoining bathroom with walk in shower and dual vanities. Finally a dog/duck themed bedroom with a king size bed, sofa for TV viewing and an adjoining bathroom with walk in shower. The amenities with astound you! Eagles Nest Lodge is the perfect vacation experience in beautiful Brown County, Indiana setting! Eagle's Nest is only 7 miles from Nashville where there is a little something for everyone.